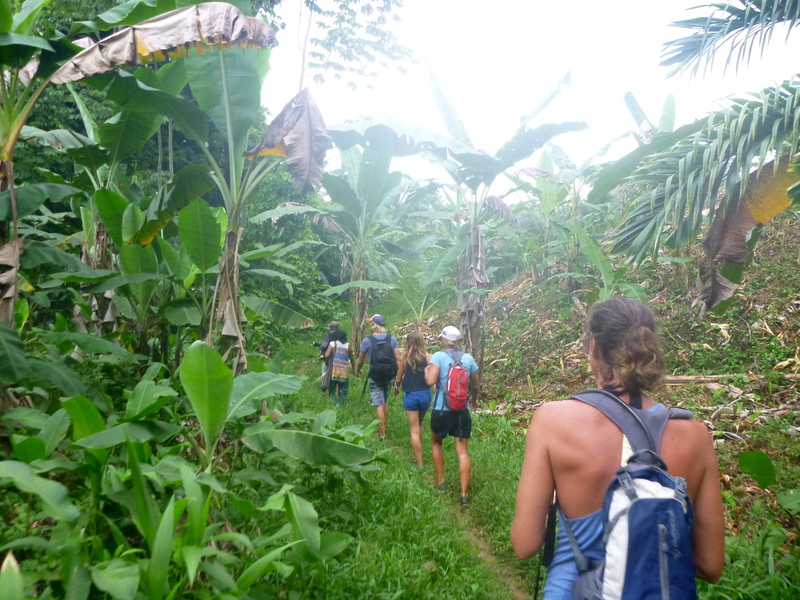 We had heard about the “Lisa Hike” since about the day we arrived in the San Blas. Prior to today we’d even attempted to go on it once. Unfortunately rain storms shut us down. But today was our day, and boy was it a day! 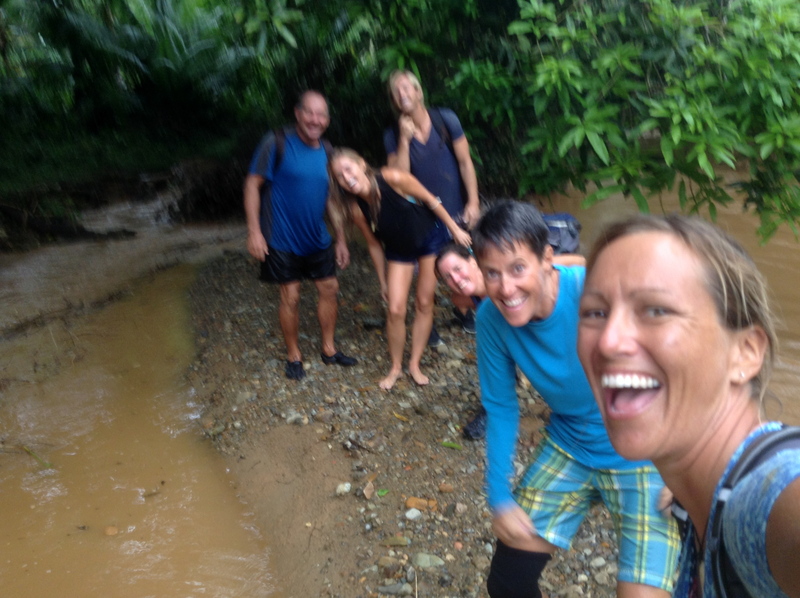 The Lisa Hike, to be clear, is a hike up a river on mainland Panama led by Lisa. 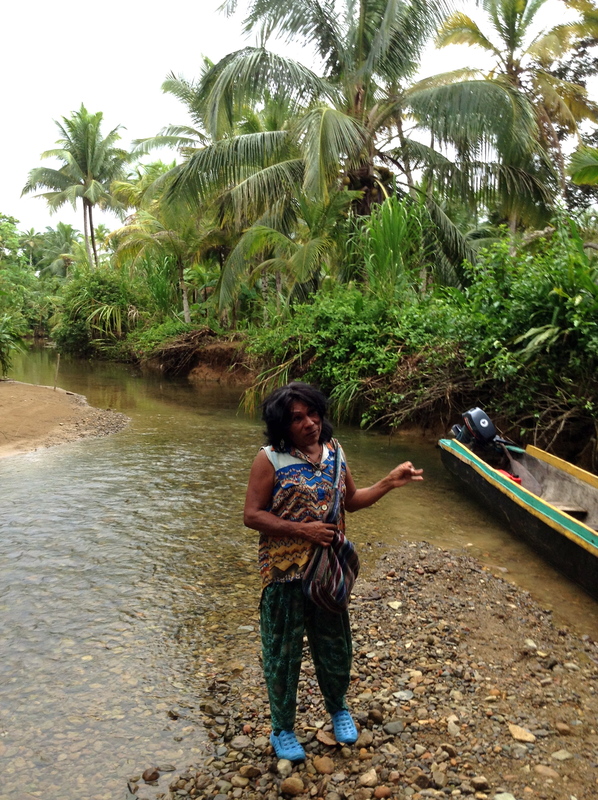 Lisa is a Kuna Yala native whose notoriety precedes her. Not only does she lead the well-known hike, she’s a master mola maker, and for us culturally sheltered folk, the first transvestite I’ve had the pleasure of befriending. 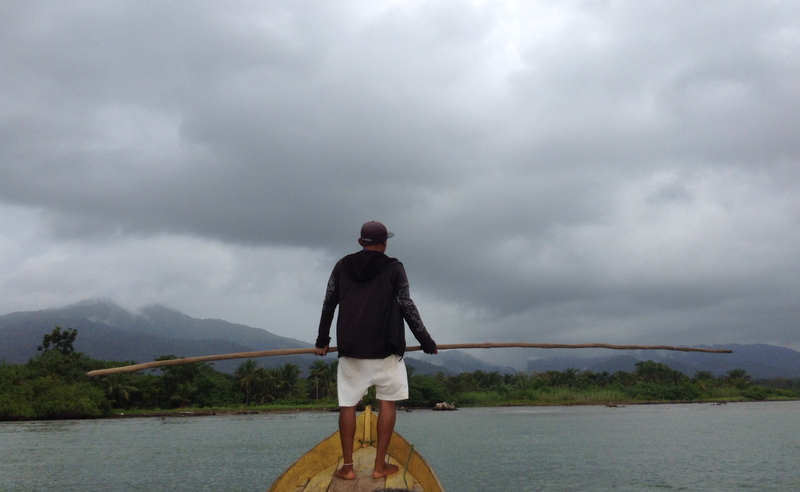 The last bit, is actually a very common and accepted way of life around the San Blas Islands. There is no stigma attached to homosexuality here. In fact, we’ve been told that families having no female children will raise their youngest son as a daughter to take up the ever important roles in their matrilineal society. 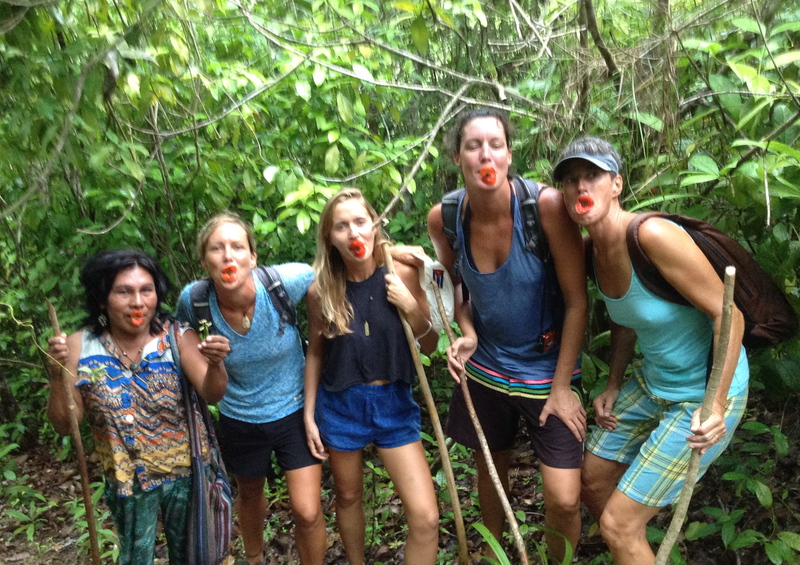 That’s right, here in the San Blas the ladies run the show. Our day started with Lisa and her invaluable helper Yonaldo rounding us (Jamie and Keith from Kookaburra, and Maria and Cathy from Joana) up in their ulu. 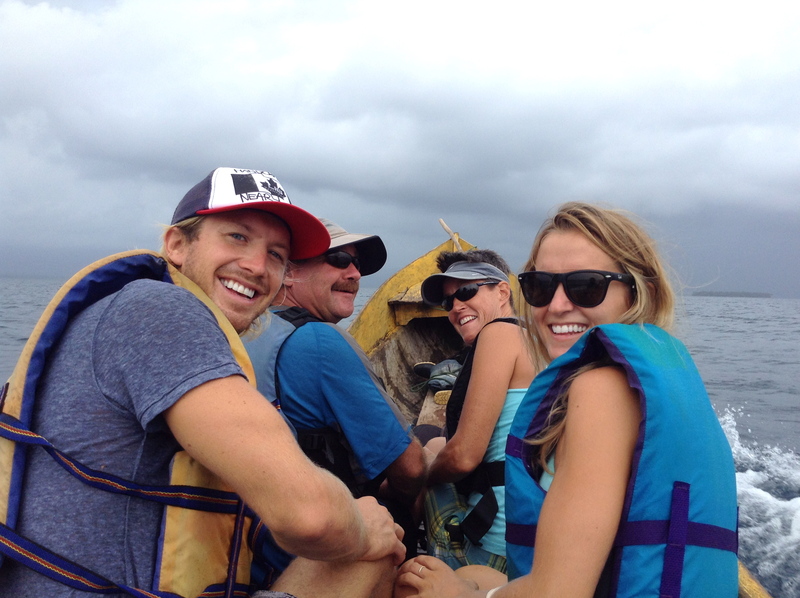 We ripped across to the mainland, began crocodile watch motoring up the river, and hopped out on a sand bar as Yolando tied the ulu off to shore. 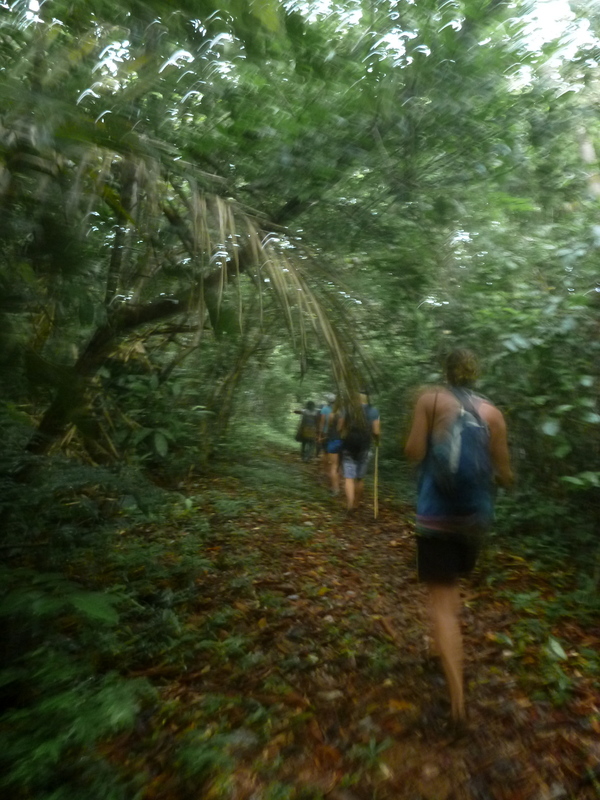 From here we began our beautiful, informative, and forgotten-leg-muscle-using meander up into the Panamanian rain forest. 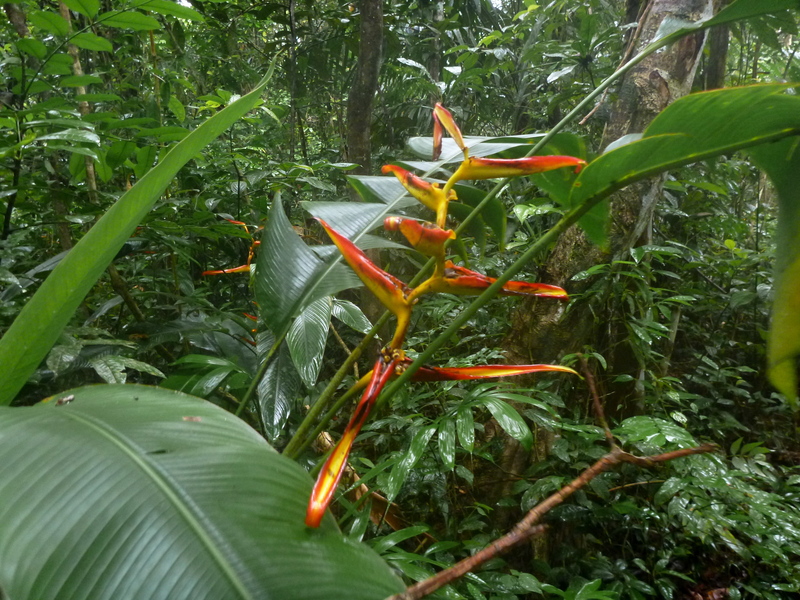 We saw an embarrassment of huge colourful birds of paradise, tested and failed at our best monkey calls, enjoyed a sweeping vista of the San Blas Islands, and even paid respect to Lisa’s parents at her privately owned family burial plot. Just as our journey peaked at the turn around waterfall, the skies opened up and treated us to a proper rain-forest rain-shower. 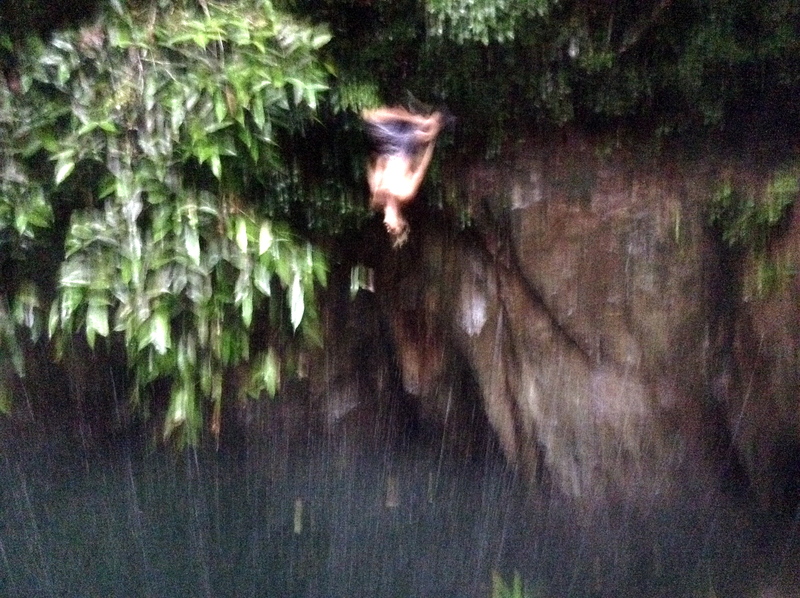 The body drenching precipitation didn’t stop us from taking the leap off the waterfall’s edge though. We couldn’t get any wetter. But it did threaten to rob us of the highly anticipated second half of our trip. 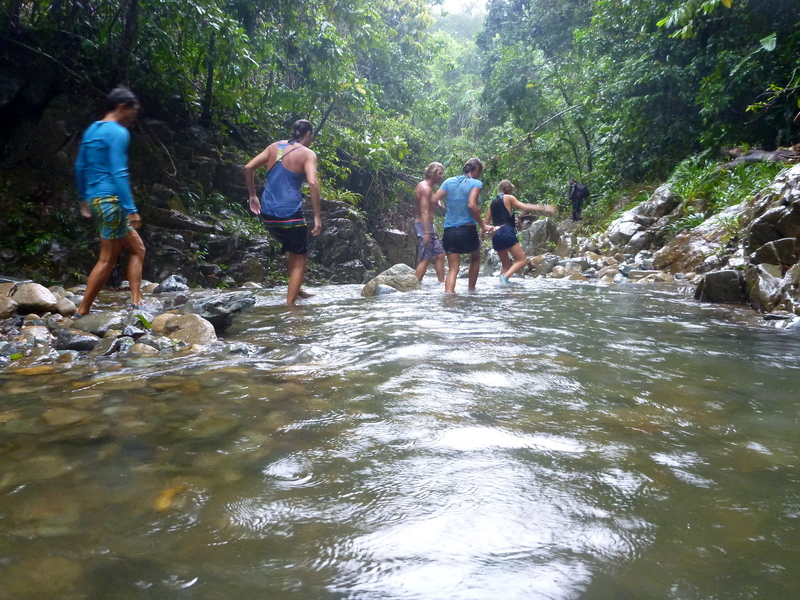 You see, the work hiking up the river was to be rewarded with a splish-splashing, waterfall-jumping, river-ride down. A good time that was now looking bleak. As the skies continued to dump everything they had on us, the worry in Lisa’s face continued to grow. Not only did she have to get a bunch of Gringo’s down the ever-quickening river, she had a boat that she hoped was still waiting for us at the bottom. We were pretty sure Lisa had made the executive decision that we would be hiking back down the way we came, so we took our time jumping into the waterfall pool below. Greg, as can be expected, showed off some aerial tricks that were made pretty sketch by the incredibly slick launching points. His attempt to backflip from a full arm hang position off an overhanging tree branch ended only slightly less tragic than his backflip off Joana. In the midst of us fooling around Lisa sat perched on an overlooking rock taking us in through her snorkel mask. Yup it was raining that hard. It’s hard to tell if she studied us and found us capable souls or complete loss causes, but next thing we knew she was asking us what we had decided. Wait a minute? We thought the call had been made, and now she was telling us we had the choice to hike down or river ride. It didn’t take us long to unanimously plunder into the river behind her. We jumped. We doggie paddled. 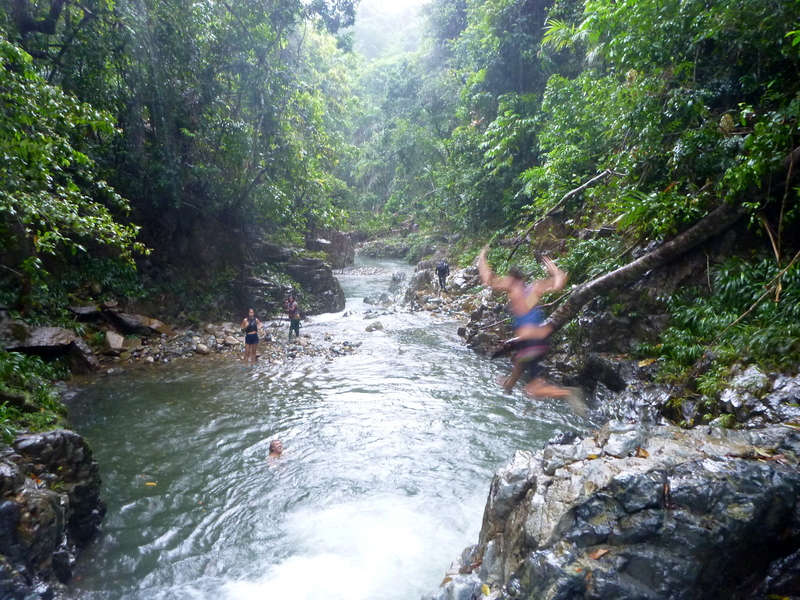 We rode natural waterslides. We negotiated rocky river beds. We. Were. Loving. It. Right up until the point we started to ask each other “did you hear that?” The rain had recently stopped, and as we went to follow Lisa across the river the unmistakable sound of rolling rocks reached us. Lisa scurried to the far shore. Greg, Maria and I backed up to surer footing. Jamie got knocked down by a shifting fallen tree. And Keith and Cathy backed up to dryer ground. The term Flash Flood has obvious connotations, but I assure you nothing makes the term more obvious than witnessing one. 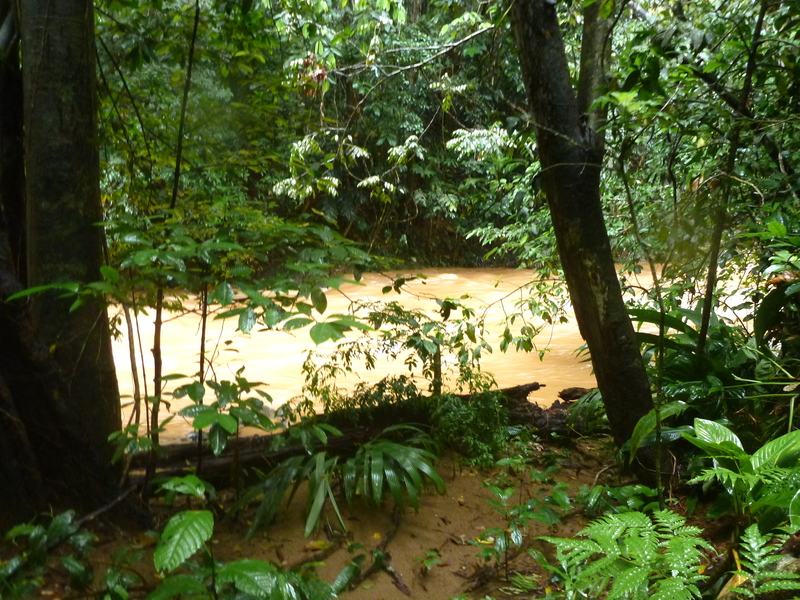 In seconds the river completely changed colour to a milky brown and widened over twice its previous size. 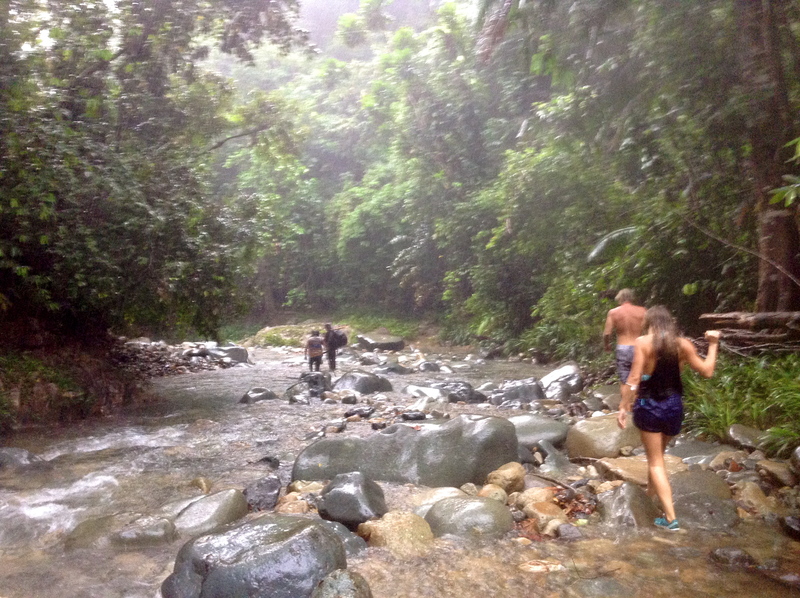 Lisa dashed down river and somehow made it back across in time, while Yonaldo lead the rest of us up the steep bank back into the rain forest. I can’t properly express how quickly it happened, or the power it conveyed, but I’ll tell you, a flash flood is not one of Mother Nature’s friendlier forces. In the relative safety of the trees, vines, and mud we spent the next hour and more bush-wacking our way back to the trail. 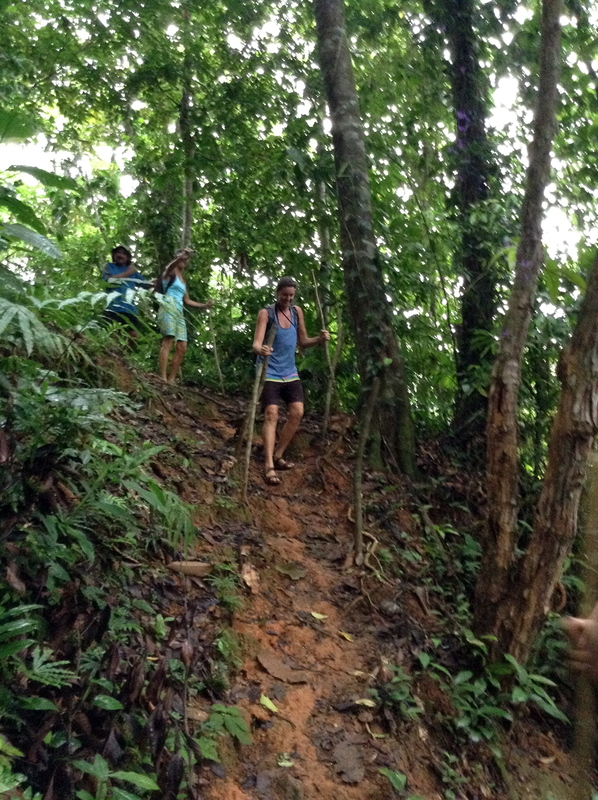 With Yonaldo and his machete in the lead (yes Greg was jealous, and yes he cursed me many times for not “allowing” him to bring his machete) we climbed and crawled our way back to the trail. Tough Mudder had nothing on us. Once back on the trail our final test was one last river crossing. On the way up I didn’t even notice we crossed the river. Can’t say I even got my feet wet. 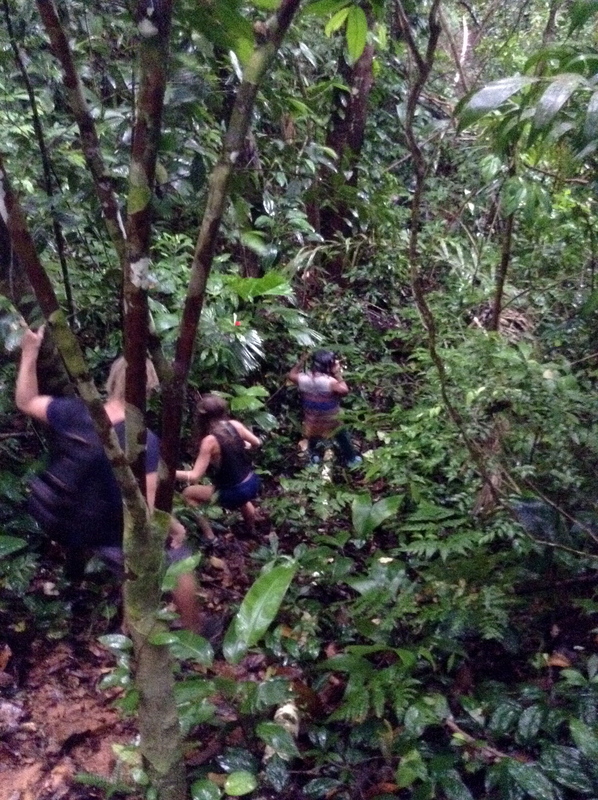 On the way back down we met a formidable foe that was waist deep and rushing like mad. Lucky for us we had Maria the Flying Squirrel, that flung herself at the far shore, and our very own river guide Keith, who showed us all how to implement a human bridge. At five people linked across we all safely found our way to the other side for the real question to be revealed. Was the boat still waiting for us? Up and down the hill and around the corner, a celebratory whoop was heard as we all set eyes on our chariot politely waiting right where we left it. In 26 years Lisa said she has never been in that same situation. We say we got the best Lisa Hike on record! 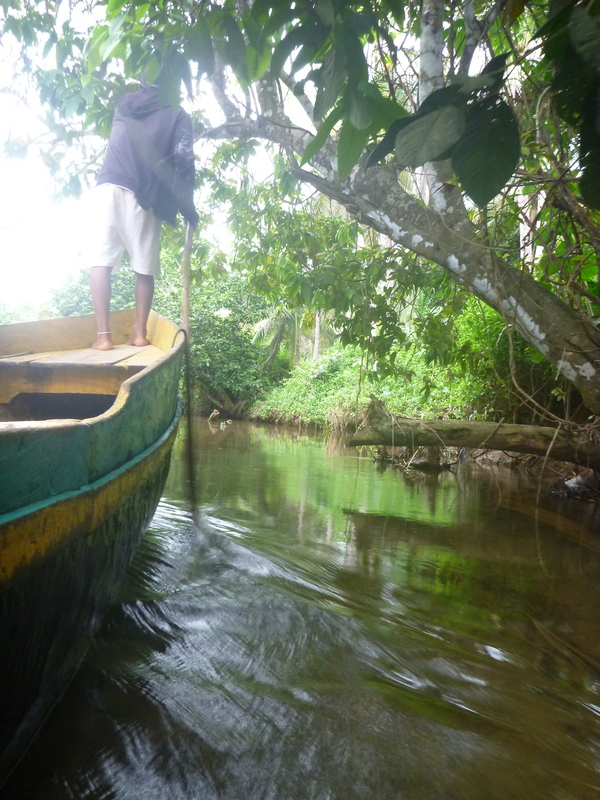 Ulu ride over to the river. Yolando sighting the shallow entrance to the river. Working our way up the river. Lisa giving us a pre game talk. On our way. Dry but sweating. 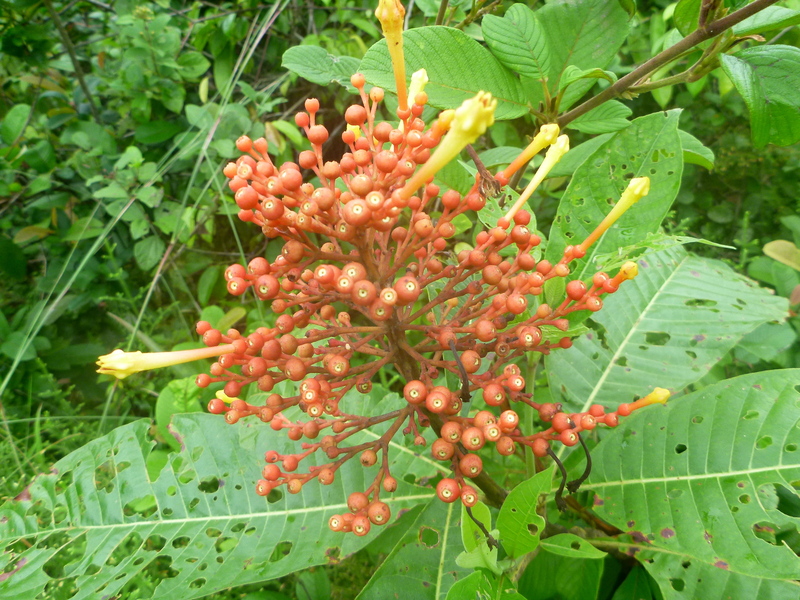 One of the many bird’s of paradise. Hot lips for the ladies. 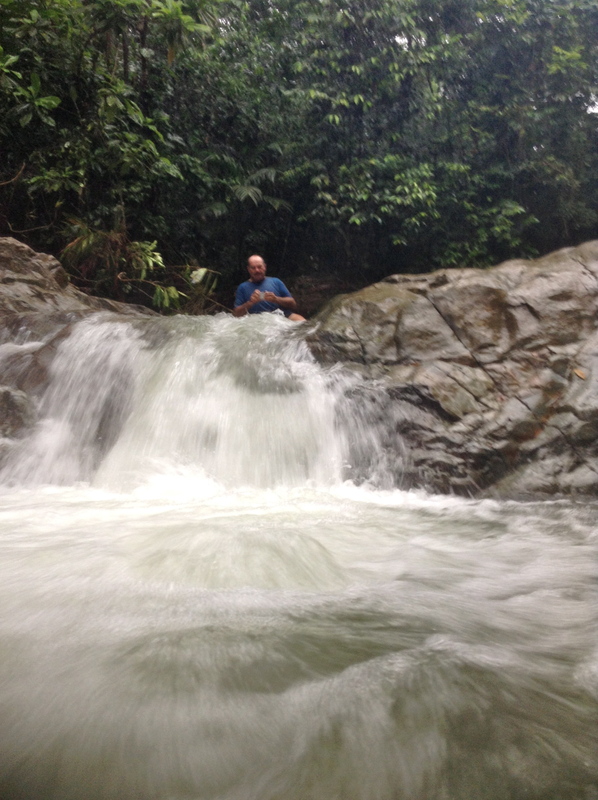 A panorama of the “turn around waterfall” spot. That blur is an inverted G Fresh. Fully saturated and making our way down. Cathy taking a leap in style. Keith hitting record before a waterfall slide. Must be only moments before everything changed. 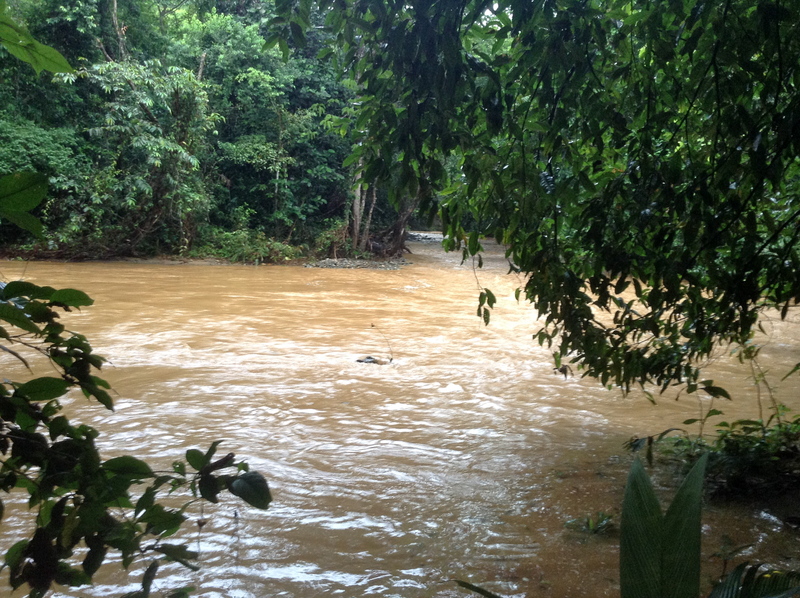 Our new view of the milky river from the trees. Off roading making our own trail. We’re back, we’re stoked, and the boat is still there! 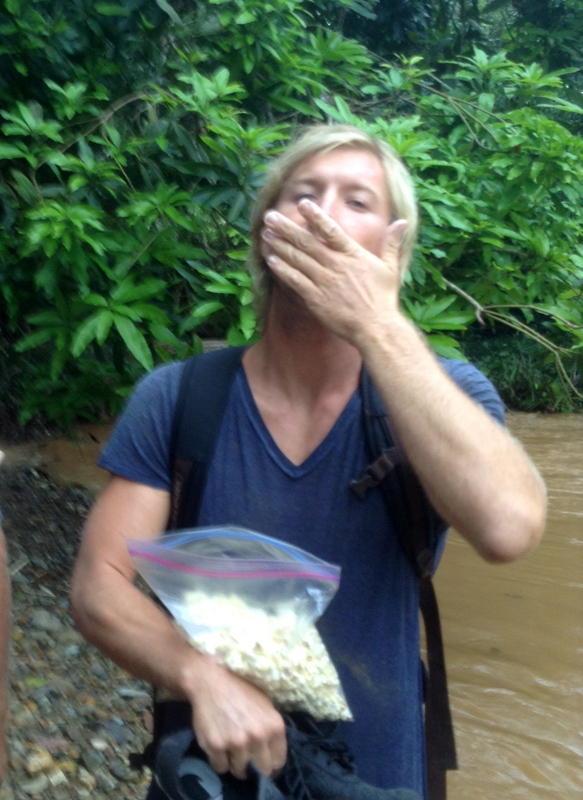 Ask Greg how much he loved the popcorn. Solid hiking food right there. Finally here’s a quick clip courtesy of Maria! !